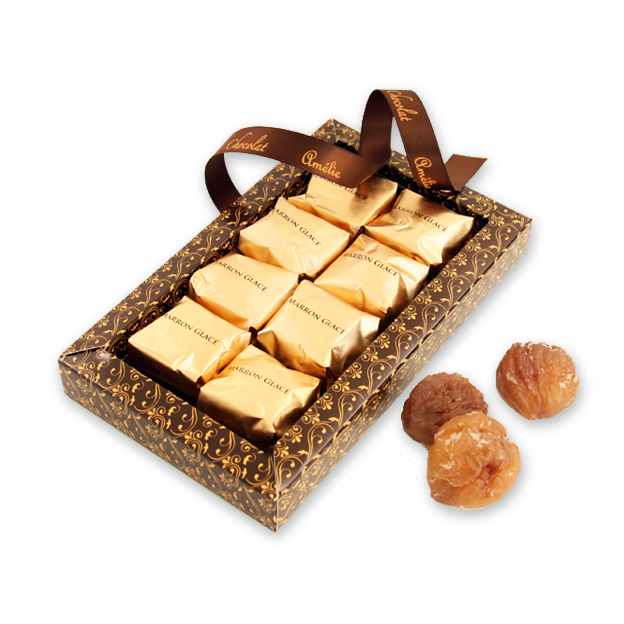 Click the button below to add the Marron Glace to your wish list. The magic of these traditional Marron Glaces stem both from their source and delicate treatment ... only about 10 out of over 80 varieties of chestnuts found in the exquisite Spanish Galician Forests, pass the test for making Marron Glace. Once selected and treated, the chosen chestnuts are, one at a time, carefully candied in syrup, and then embellished with a fine vanilla-scented glaze. This delicate treatment takes 240 hours of patience, commitment and perseverance ... and is clearly justified by the genuine character and goodness of the unique product. Eight delicate Marron Glace, each individually wrapped, are sealed in a freshness pouch and presented in a beautiful Amelie gift box with hand tied satin ribbon. This is a unique delicacy, renowned for its exceptional quality - and will delight any lover of excellence! Finish with your personalised message card for a superlative gift.